THE idea sounded so simple when it cropped up in the pub one night. To ride as far as we could around Europe taking in as many countries as possible. And to do it all in 48 hours. The first question was what bike to take. The most obvious choice would be a Pan European or one of the bigger tourers from BMW. Bikes you could sit at 100mph on all day and only have to refuel every couple of hundred miles. Preferably something with a CD player to stave off the boredom of mile after mile of motorway riding. But that would be just too easy. So after debating long and hard we finally ended up with a decision. A year 2000 FireBlade! OK, so it’s not the first machine which comes to mind – but MCN reports had said it was capable of crossing continents. Ijust hadn’t banked on putting that to the test so soon. Still, I’d accepted the challenge and there was no backing out now so I turned my attention to making the plan work. After sorting stuff like fitting some new tyres, booking crossings, choosing riding kit and getting some breakdown and accident cover, it was all set. Even if I wasn’t. The shocking reality quickly became apparent as the day drew closer. The more I thought about it, the more I realised this trip was going to be no holiday. It was a mission of mileage and the only thing that mattered was keeping the wheels of the Honda turning... as fast as possible. There would be no time for sight-seeing, fancy food or calls home to the girlfriend. And shorts and sun-tan lotion were definitely not on the list of packing essentials. It was all about buckling down and racking up the miles. The next day wasn’t much better. As I loaded the Blade at 5.30am with Givi tank and seat bags another hotel guest asked if I was going far. I settled for the single word: " Yes " . Determination got the better of me and I joined the queue for the Channel Tunnel. Spotting lots of different nationalities’ registration plates in the line-up made me think. I was about to go to all their homelands... and not by the direct routes they were taking. Forty minutes later I’m on French soil – country No2. It’s still wet and the roads look greasy. But compared to what it was like in the UK yesterday it feels positively summery. The mission is now fully underway and I’m making rapid progress down the autoroute towards Belgium. The Blade feels good. The tall tank bag is helping to protect me from the wind and it’s easy to cruise at around 110mph. The strong engine is paying dividends. When the car in front moves over it’s just a case of twisting the grip to surge past. I’m going to pick fault a little with the motor later. But for now I’m well chuffed with the bike. It’s vital I keep the pace up, but I’m not taking any risks. Any mishap at this stage could blow the whole thing apart. But with some miles under my belt, my mood’s picking up. And it’s about to improve even more. Belgium – country No3 – might be better known for Stella and chips with mayonnaise than good weather. But I’m getting pretty warm under my all-weather gear as the clouds subside and the sun comes out. I fit a tinted visor, don some thinner summer gloves and press on. Soon after, Holland’s best- known attractions – and I don’t mean windmills – are tempting me to stop. But there’s a more important issue – I’m in country No4 and there’s a long way to go. The digital temperature gauges on office buildings near Antwerp are showing double figures and I’m feeling pretty pleased with things. Even if I can’t see so well through the fly-spattered visor. But I’m about to get even warmer and slightly irritated. After I trek to the loos at some services the lady at the door asks me for the equivalent of 20p before I can pee and Idon’t have the appropriate change. Next time I’ll stick to the biker’s favourite and use a nearby tree. Trudging back to the bike for the measly sum means the sweat builds up even more. So the question is, do I peel off down to my leathers, or do I soldier on ready for any rain that might fall later? The answer is provided by the Blade’s lack of luggage space. As there’s nowhere to store the gear I stay fully-dressed. It’s one of the sports bike’s few shortcomings. There are a few other niggles, but overall it’s doing a surprisingly good job at covering the distance at speed and in comfort. The riding position is relaxed and the windblast isn’t enough to make me consider backing off. Sure, a dedicated tourer would be more convenient, but I can’t really complain. And the Honda will have benefits later on. Its light weight and small size mean it’s easy to snick through the heavy traffic. But as Iweave my way through Liege, an old dear seems determined to stop my progress. Nothing Ido will make her pull over, but eventually a space opens and I’m through. Ijust don’t have time for this sort of thing, Ihave to push on. In fairness, she’s in the minority. Euro drivers are generally far more biker-friendly than Brits and riding on the Continent can be a rewarding experience. Out on to the motorway again and I’m starting to get bored. The tedium of the seemingly endless straights is getting to me. The one I’m on now, through the picturesque Ardennes mountain region, has some pretty scenery either side of it. But the monotony of cresting one horizon after another just to stare again at another five-mile stretch of carriageway in front of me isn’t particularly inspiring. I see signs for the Spa race circuit and would love to take the Blade around its famous curves. But time is of the essence and such thrills can’t be afforded. I’m pretty much on target, but the pressure of meeting the 48-hour deadline is always in the back of my mind. So much so that I’m looking at cows and sheep chewing on grass in the fields nearby and feeling envious of their relaxed life. Things pick up when Luxembourg comes and goes. That’s country No5 then. But the time issue becomes more apparent again when the traffic slows to walking pace in Strasbourg, back in France. At first I’m thinking it’s everyone leaving work and causing a rush hour. But the long queues have formed because of an accident. The policeman at the scene doesn’t like my fast filtering and shouts at me to toe the line. But I’ve got time to make up and I’m tempted to shout back at him. The language barrier makes it futile so I carry on. Probably best. Then just to add to the fun it starts raining again. But my kit is keeping me dry and my spirits stay fairly high. Although the Bridgestone BT010s I’ve fitted for the trip are gripping well enough, the amount of standing water on the road is making life feel a bit scary above 80mph. As luck would have it, the rain stops just as I turn off the motorway and get on an A-road bound for Freiburg in Germany –country No6. It’s great to heel the Honda over after spending so many hours in the upright position. And though the luggage is a bit heavy and bulky, restricting how much I can chuck the bike around, the Blade is still handling really well. The suspension and brakes are excellent and as the sun comes out Ireally start enjoying myself. The engine’s power is definitely a lot more impressive above 6000rpm and it pays to rev it harder. Play around with the gearbox to keep the engine on song and the Honda feels as strong as an R1. As darkness descends I cross the border into Switzerland – the end of the first day on the continent and I’m in country No7... I’ve got a lot of work ahead of me. And after a brief look around the squeaky clean streets of Basel I stop for the night. The moment I wheel the bike into the hotel’s garage it starts to chuck it down again. I’m chuffed at the timing. A 6am start is met by more wet weather and conditions going through Zurich are absolutely atrocious. I might have thought things were bad in France yesterday, but they’re not a patch on this. My kit is keeping me dry, but the serious lack of grip from the waterlogged roads is putting me right off. The whole thing’s getting beyond a joke and I’m wishing Mr Scott would beam me up to someone warmer and drier. But the show has to go on and my patience is rewarded as the Tarmac dries once more. By the time I get to the principality of Liechtenstein – country No8 – life’s good again and I head on to Austria – country No9 – as soon as I can. It’s a beautiful part of the world here and the scenery is luscious. Huge mountains dominate the horizons and the forests add to the picture postcard landscape. Everything’s immaculate. There’s no litter or graffiti and every man and his dog look ultra-smart. But I hate it with a passion – because there isn’t any. There’s a distinct lack of personality about the place. It’s just too straight. No-one seems to misbehave. Everybody sticks to the speed limits. You get the impression doing a wheelie or burn-out would land you in jail in seconds. 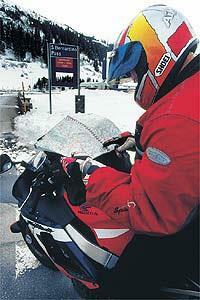 Checking the map I hope to get to the more characterful Italian region within an hour. But a quick blast down a Swiss motorway doesn’t last long. I need more photos of the Blade in this idyllic picture location and stop on the hard shoulder. Moments later so does a Swiss traffic cop. And though he’s polite and friendly in his furry hat he wants me to move on. Then he notices I have no motorway tax sticker on the Honda and sells me one for £35 so I can proceed. Expensive photography! I’ve knocked Switzerland a bit so far, but if you can stand all the rules, the scenery will win you over. Heading up to the San Bernardino pass is breathtaking. You’re right in the Alps here and the roads are the business. But caning the Blade has emptied the tank in an area where petrol stations are sparse. The ones I’ve tried so far only accept credit cards, but for some reason mine won’t work. I’m worried about running out and then I find the pass is closed. Things are looking a bit bleak. but a local cheers me up by telling me the nearby tunnel will get me through to Latin quarters! Even so, coasting down the mountain on virtual tickover can’t stop the Honda running dry and I coast to a halt. Luckily MCN’s photographer Mark Manning is still up and running on his X-11. He heads off to buy fuel and I only lose half an hour. Getting to Italy – country No10 – cheers me up massively. Just dropping down from the high altitude of the summit of the pass has brought temperatures up by around 10 degrees. And by the time I’m at the border it’s sweltering. The insipid nature of the Swiss and Germans is replaced by the gung-ho enthusiasm of the Italians. They might not be rich enough to drive the numbers of Porsches and Ferraris you see in Switzerland, but at least they get on with things a bit faster and with loads more style. Even a Fiat Uno is taken to the limit if it’s driven by an Italian. The furious pace at which they motor along hasn’t always pleased me in the past. But because I’m so far behind with my target the flat-out racing is suiting me fine. Cruising at over 120mph claws back some much needed time. But taking the wrong route round the city of Torino means a long evening ahead. Navigating the heavy traffic of Torino’s ringroad I’m irritated by the low-down flat-spot in the Blade’s power curve. From tick-over it pulls quite well but as soon as it hits 3000 rpm it’s like someone has whacked it on the back to clear its chest and it suddenly takes off. This can be a bit tricky and can catch you out at times, especially if the road surface is very slippery as it had been at times so far. The frustration of being behind schedule is making me a bit sensitive now. And when a car driver carves me up while he’s on his phone and then shouts at me at the next toll booth it all gets a bit much. I jump from the Blade and give him a lesson in English language – though the words I’m screaming at him won’t appear in any dictionary. None the wiser, we both move on. I’m trying to get to the French border as soon as I can and want to take some photos in Monaco. A decision to take a short-cut through the mountains proves to be costly. The views are spellbinding and the villages en-route look inviting, but there’s no time to waste. Ipress on grimly. I’ve just got time to see the Med before night falls as Ihead into Nice. The flash buildings and cars scream affluence and influence, but I don’t have time to study this in too much detail. Next on my target list is one of the world’s richest and famous places – Monte Carlo. It’s only a principality, but for our purposes it counts as country No11. Suddenly my respect for F1 car drivers rockets. To think that Michael Schumacher and Co go as fast as they do round these narrow and winding streets is unbelievable. The TV screen doesn’t do them justice – they’re true heroes. So too arguably are the scooter riders. Even late in the evening there are tons of them carving through the traffic at breakneck pace. And even with over 10 years of despatch experience in London behind me, and a light and nimble Blade with 130bhp on tap, I have no chance of keeping up. Having decided now I’ll have to forego sleep if I’m to make my target within my 48-hour time limit, Ibecome more competitive on the autoroute down into Spain and am helped a great deal by the French drivers. As soon as they spot you in their mirrors they make every effort to let you pass. Although there are the odd few nutters who seem to think they’re racing in a GP. There don’t seem to be too many driving rules in this part of France. Or not many that are enforced at least. It’s like Wacky Races in real life. The motorway in this region is nice and swoopy and in some places almost traffic-free. You can corner at over 140mph if you dare and use all three lanes without upsetting the law. Ifeel like an endurance racer on the night time shift and the experience highlights the Honda’s excellent handling. This high-speed blasting on the Blade is pushing up my average speed. And though the trip over the high plain on the French coast between Marseille and Perpignan is exposed and very windy I’m soon near to the turn off for Andorra – country No12. My emotions are riding high and as the first signs of dawn begin to appear, I’m starting to feel the end is near. The warmth of the anticipated achievement is growing and there’s only about a hundred miles left of this epic journey. And the trip is very much ending on a high note. The road from Perpignan to Andorra is an absolute classic. Smooth twisting Tarmac with a huge variety of corners tested the Blade and its Bridgestones and both coped superbly. If I had had the energy, I would have booked into the nearest hotel, stripped the Blade of its luggage and gone out for a scratch. Just an hour-and-a-half of this biking bliss gets me to the border of Andorra and the finish line of this two-day marathon. It feels like I’ve been on the road for weeks and I can’t believe I was in England such a short time ago. After 1800 miles in that short time I’m feeling pretty smug. I’m sure it’ll take some time to sink in, but right now I’m happy I got a bit messy in the Kettering pub and decided to do this. I’ve still got 1200 miles to go before I’m back home in the UK so I’ll have put 3000 miles on the Blade in total. The Honda, the Bridgestone tyres which are hardly squared off at all, the luggage and the riding kit have all been superb. And the trip shows what a great time you can have touring on the Blade – I don’t even feel too sore.